Okay, you’re back and ready to complete the Review section? Cool! 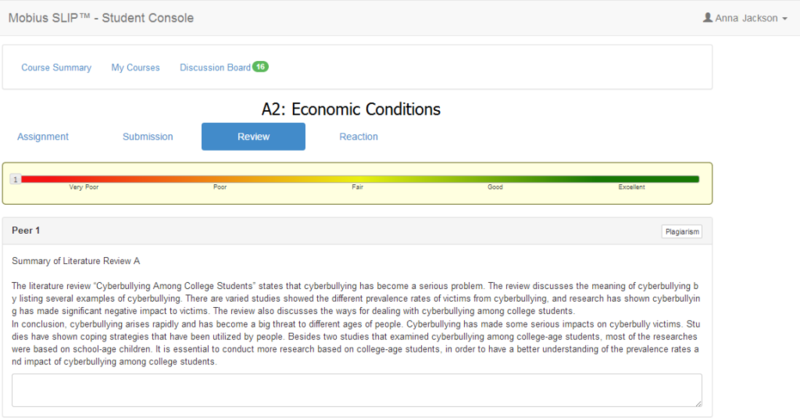 The Review task consists of two parts- Evaluation (Benchmarking) and Critiques. This is where you use the numbered handles on that mysterious bar that follows you as you scroll down the page. It’s magic, don’t worry about it. Now, for each peer Submission that you review, you need to evaluate (benchmark) its qualities from Poor to Excellent on that bar. This should be based off of your instructor’s criteria for evaluating the Submission. Each numbered Slider handle corresponds to that peer’s number. For example, Handle # 3 goes with Peer 3. Once you benchmark each of your peers, now you see an M-handle. M means Me, or well, you. This is where you place your submission among the submissions of your peers, based upon comparative quality. Under each Submission, there is a Provide Critique section. Here you will give your peers feedback on their Submissions. Don’t be nervous. Here are a couple of good tips on giving feedback that will serve you well on your assignments and, well, for the rest of your life. Be clear in your critiques. Do not be vague. If you suggest that a peer should correct something, provide details and examples. Take the time to really review the piece. If you are rushed, you will have the tendency to go with your first reaction and write a critique that turns off the reader. Be courteous. Suggest that a person look at areas that you feel they should improve on. To be effective, do not bark orders at them. They will become offended and will not be as receptive to your feedback, no matter how good the information you have to share with them is. By saying “Good job” you do not do a good job, it is nice but not helpful. To fully experience peer evaluation the way that it is intended to be used, you need to participate. In the corporate world, patting someone on the back and telling them good job doesn’t help them grow. Mobius SLIP is your practice field. Practice critiquing people, it will help them along the way. Last, but not the least, always start with the positive note, even if you completely don’t like the work of your peer, find some positive aspects of it, and point them out, then, gently, start pointing out the drawbacks and suggesting changes. Once you reviewed the work of each peer, including yours, click the Save and Submit button. You have to enter some text in every text field in order to save your critiques. You can modify your critiques and benchmark bar choices until the due date. The last step in the Review phase is for you to go back and reflect (or evaluate) your own work. Based on what you’ve seen of your peers’ work, what have you learned from them and how do you plan on improving your future assignments. This is a very powerful tool and lets your professor know what you’ve truly learned from this assignment. Whew! Giving that feedback and self-reflecting was some hard work, wasn’t it? Well, you are all the better for it. Take a breather, you’ve earned it. The Reaction section will be due soon.